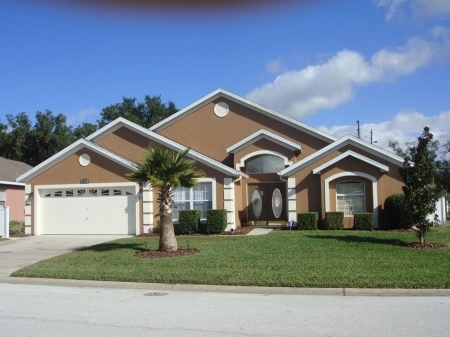 A WONDERFUL4 Bed/3 Bath Home for your Florida Vacation - a real home from home!The home owner has provided many superb features to this great home to make your stay as comfortable and as much like home as possible. Featuring over sized TV screen in the Family Room with a huge selection of Videsos and DVDS to choose from to keep you and the family entertained whilst relaxing in style. Golf courses abound near this home and the world famous Champions Gate is the closet with local supermarket shopping and other convenience stores only minutes away from your luxury home. A large Private Pool with extended decking and covered lanai also has an in ground spa to relax in. A gas BBQ grill is provided, please ensure to keep this clean for the next guests. Larger than average floor plan with Family Room and spearate dining area.Over large kitchen with seating for up to 10 people, fully equipped for your vacation culinary requirememts. King Master Bedroom with large bathroom including shower stall and sunken garden tub Access through patio doors onto pool deck. 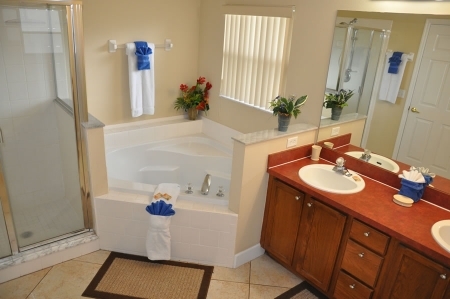 Unique Queen Bedroom with its own bathroom and pool bath door is housed in a separate in-law suite offering great privacy to family members traveling together. Lovely gardens to front, located on a quiet cul-de-sac near a natural 40 acre lake, great for walks or biking. Laundry with washer and dryer, iron and ironing board as standard.